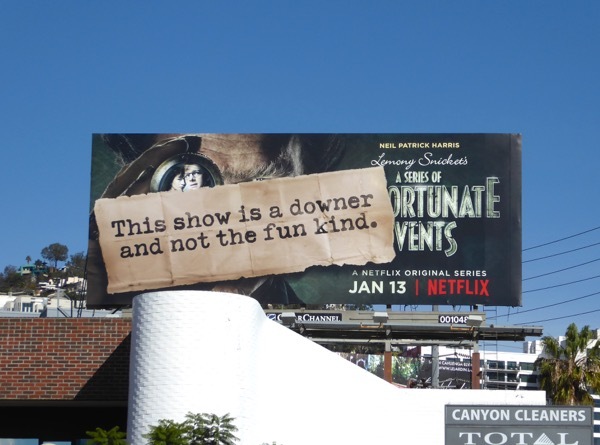 This January Netflix is getting literary and adapting Lemony Snicket's A Series of Unfortunate Events to be streamed on the small screen and having fun in the city skies promoting the new eight-episode series. 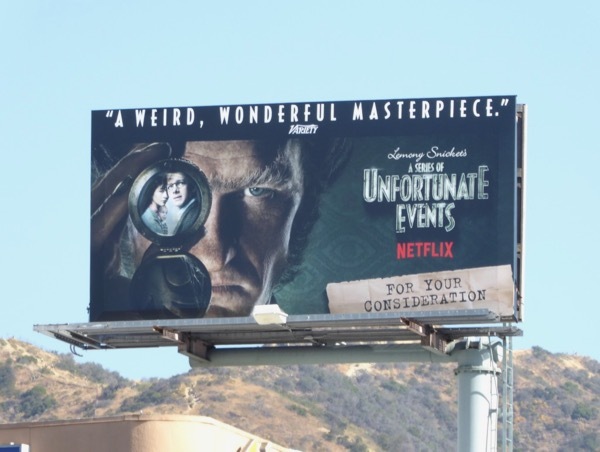 For those not in the know, Lemony Snicket is the pseudonym of writer Daniel Handler and it's not the first time his children's novels have been adapted, with Jim Carrey starring in the 2004 big screen movie. 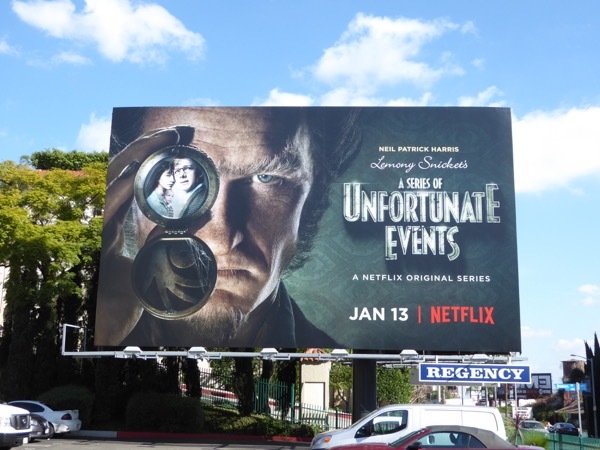 Lemony Snicket is also the narrator of this offbeat family fantasy series (in this instance Patrick Warburton), whilst Neil Patrick Harris plays the sinister 'Count Olaf', the distant relative who becomes the ward of three 'Baudelaire' children who become orphaned when their parents die in a mysterious fire, and who is secretly plotting to steal their vast inheritance. 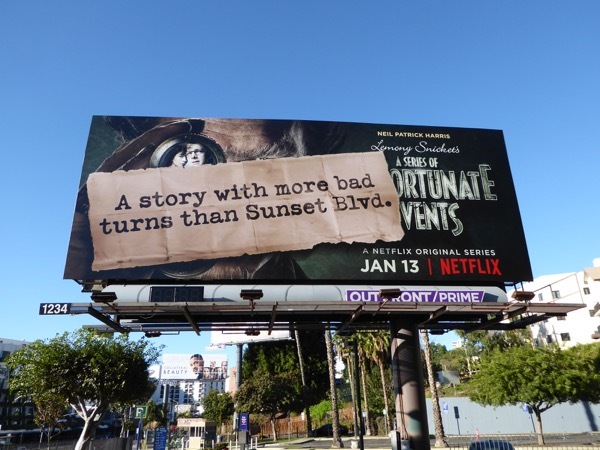 Malina Weissman, Louis Hynes and Presley Smith play the trio of children facing the fantastical trials and tribulations to discover the dark secrets of their family. 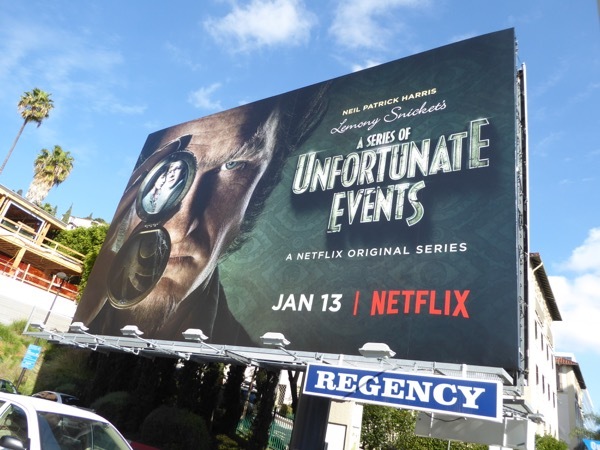 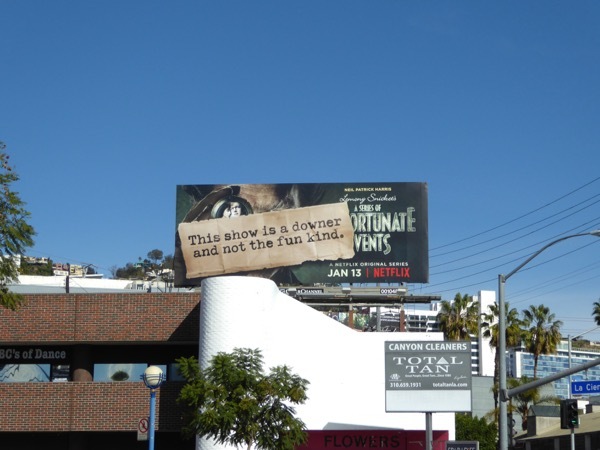 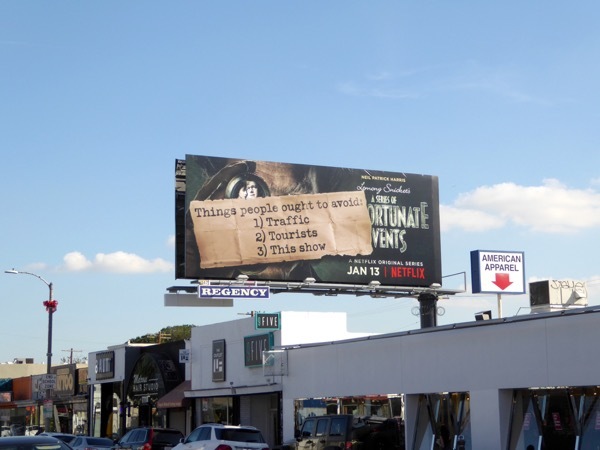 These series launch billboards were snapped along the Sunset Strip, Melrose Avenue and Santa Monica Boulevard from December 29, 2016 to January 8, 2016. 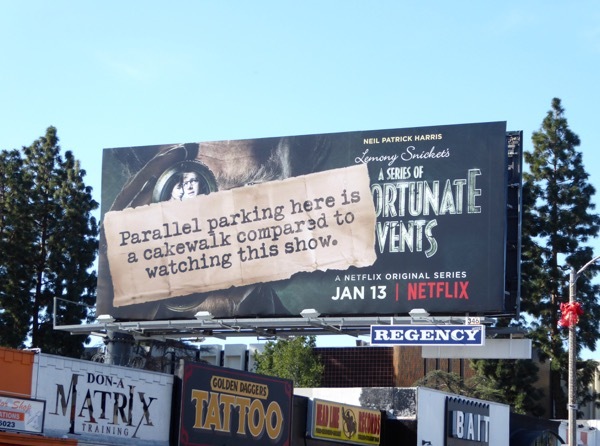 The snarky teaser billboards help create some intrigue for the new show and some of the ad creatives even have a witty local spin, alluding to 'more bad turns than Sunset Blvd' with billboard along West Hollywood's busy Sunset Strip and another about the notoriously bad parallel parking situation along Melrose Avenue. 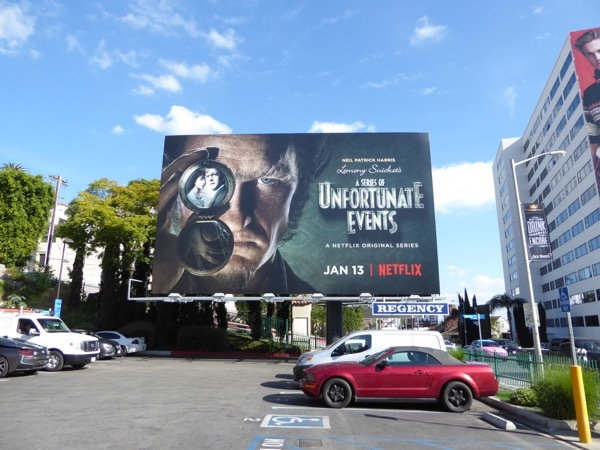 Fans of Neil Patrick Harris can also check out these Best Time Ever TV billboards, this 87th Oscars billboard, these movie billboards for A Very Harold & Kumar 3D Christmas and these movie billboards for A Million Ways to Die in the West. 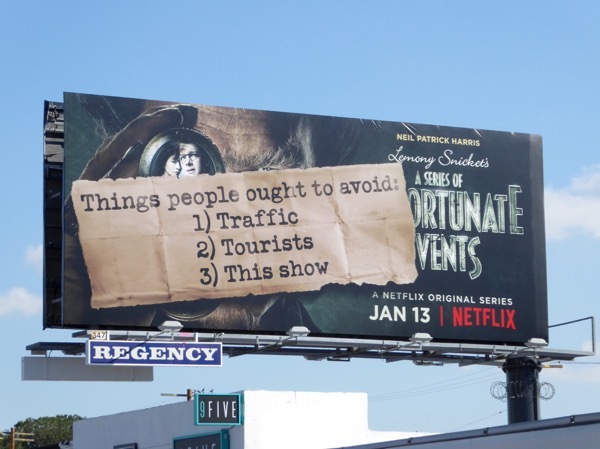 If you're in a curious mood for some frightful, freaky adventures with lots of reckless child endangerment, then this may be the series for you. 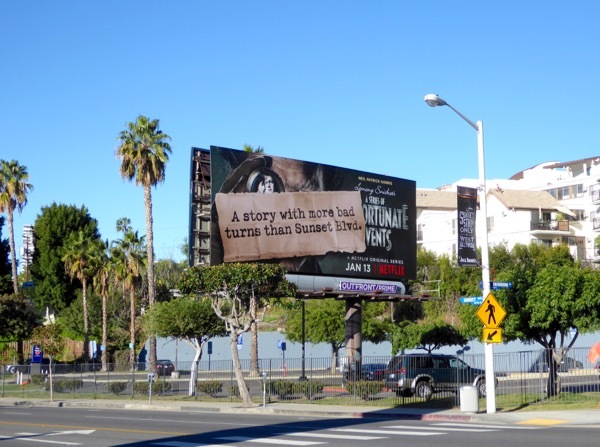 UPDATED: Here's also an Emmy consideration billboard for the debut season snapped above La Brea Avenue at Sunset Boulevard on May 28, 2017.